Several unions are planning to file grievances on behalf of the workers who lost their jobs. About 50 employees have been fired from Essentia Health, a Duluth, Minnesota-based hospital chain, for refusing to receive the flu vaccination, according to multiple news reports. More than 99% of Essentia’s employees had either received the shot, had an exemption, or were in the exemption process. Essentia Health is an integrated health system that serves patients in Minnesota, Wisconsin, North Dakota, and Idaho. It has 14,700 employees, including more than 1900 physicians and advanced practitioners. Many hospitals now require flu shots to be administered to all workers. The Infectious Diseases Society of America, the Society for Healthcare Epidemiology of America, the Pediatric Infectious Diseases Society, and other groups all support mandatory immunization of healthcare workers, with no opt-outs except for medical reasons. The United Steelworkers, 1 of 3 unions working to protect hospital employees, filed an injunction to try and delay the policy from going into effect, but a federal judge denied that request. At least 2 other unions are filing grievances on behalf of the workers who lost their jobs. According to the Centers for Disease Control (CDC), fewer than 45.6% of Americans got a flu shot during the 2015-2016 flu season. 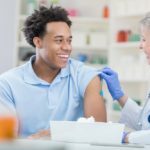 However, the CDC as well as the Advisory Committee on Immunization Practices (ACIP) and the Healthcare Infection Control Practices Advisory Committee (HICPAC) recommend that all US healthcare workers get vaccinated annually against influenza.